You don’t have to visit a tropical island to enjoy colorful and exotic blooms and vibrant, lush foliage. In fact, there are many tropical flowers and plants you can grow to create your own tropical oasis. Plant tropical flowers of different shapes, heights and textures to create your very own jungle and tropical flower garden. Canna lilies are tropical flowers that provide vibrant splashes of color to the landscape. These summer blooming flowers have an upright form with bright green leaves that grow 6 inches wide. 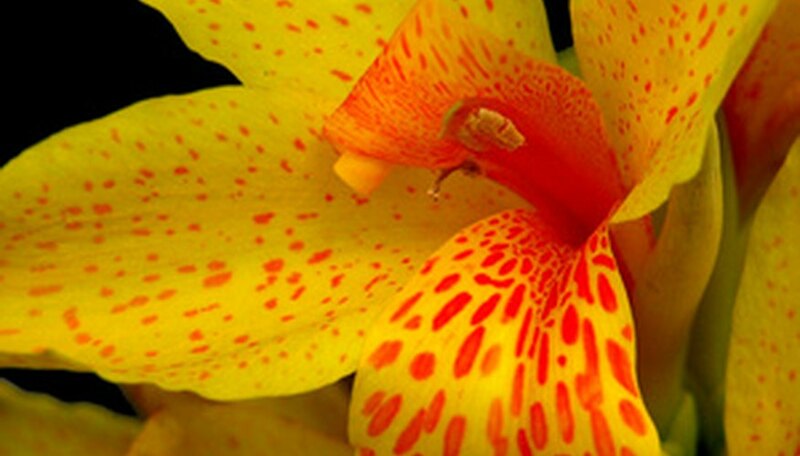 Canna lilies grow 24 to 48 inches tall and have a variety of flower blooms including yellow, orange, pink and red. Canna lily blooms emerge in summer to last until the first frost. These striking flowers are ideal growing in a tropical garden or lining a front walkway for bright bursts of color. Canna lilies are drought tolerant and prefer full sun and rich, fertile soil to thrive. The USDA plant hardiness zone is 8 to 10. Hibiscus is a summer-blooming perennial, tropical flower that grows in a dense, upright form. The flowers on the hibiscus plant are funnel-shaped with a single or double flower bloom that grows 4 to 8 inches wide. Colors on hibiscus range from yellow to red and pink and white. The bright blooms are striking against the prominent stamens that are red and yellow in color. Hibiscus plants grow up to 15 feet tall and 5 to 8 feet wide, creating a brilliant landscape presence. Hibiscus flowers require full sun and well-drained, moist soils to thrive. The USDA hardiness zone for planting is 5 to 9. The candle bush is a small shrub with bright yellow flower blooms that are candle-shaped, hence the name candle bush. The vibrant flowers stand on upright, erect stems and bloom throughout the year. The leaves on the candle bush are oval in shape and bright green. This tropical plant grows up to 10 feet tall and has a spreading growth habit of several feet. The candle bush is a hardy plant that is drought tolerant. It prefers full sun and can grow in a wide range of soil types, making this tropical plant versatile. The USDA hardiness zone for planting is 8 to 11. The silver mimosa is a medium-sized evergreen with showy blooms. Beginning in late winter to early spring, the small, yellow puffball-like blooms emerge to brighten up the landscape. The fern-like foliage is bright green and contrasts with the round flowers. The leaves on the silver mimosa are bluish silver in color. Silver mimosa trees require full sun and well-drained soil. The USDA hardiness zone for planting is 10 to 11.